A number of routes reach its summit. The Long Trail crosses Route 108 at the foot of Smugglers’ Notch, from which it is a steady 2.3-mile climb to the Chin. From farther up Smugglers’ Notch, the even more difficult Hell Brook Trail covers nearly the same elevation gain in only 1.8 miles. For a beautiful four-mile hike without the grueling climb, you can drive the Toll Road to the Nose or ride the gondola to just below the Long Trail and hike just the summit portion. Whichever route you take, stay on the trail to avoid harming the very delicate plants of this fragile ecosystem. Tundra once covered a far greater area, but as the glacier receded, the climate grew too warm for these cold-loving plants. Only on the exposed summits did conditions remain hospitable. The tundra looks like a grassy meadow, and in the lower areas where moisture gathers, small peat bogs have formed. While it is tempting to get as close as possible to these rare plants, remember that although they are resistant to severe weather, they are very sensitive to foot traffic. One of the most memorable views in Vermont is the reward for this moderately stiff climb with a vertical rise of about 1,500 feet. You can take either of two trails, one from the north end of long Lake Willoughby, the other from the lake’s southern end. Or if you don’t mind walking almost three miles back along the road, you can make a seven-mile loop. The walk along Route 5A borders Lake Willoughby, and traffic is rarely heavy. Getting to the top of the cliffs is about the same from either direction, a mix of woodland and rocky trail, with some brook crossings on the North Trail. There are some steep sections either way. 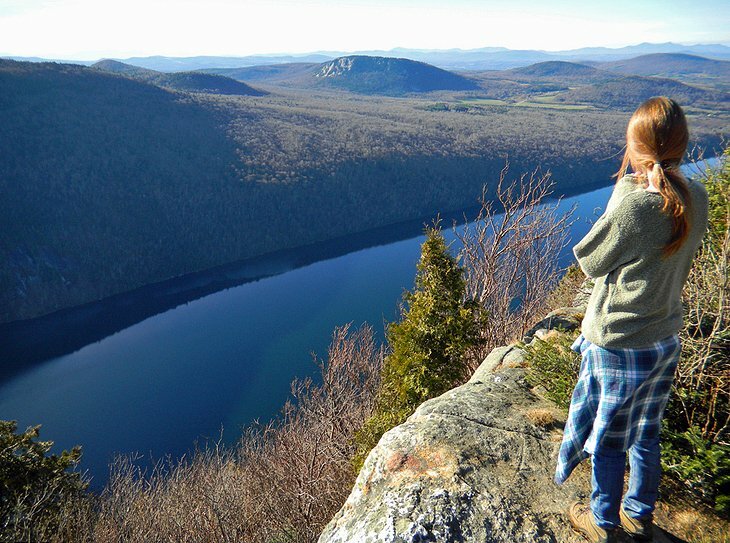 The North Trail is about half a mile longer, but South Trail includes the view from Pulpit Rock, 550 feet directly above Lake Willoughby and one of the most dramatic in the state. Also impressive are the long-distance views at North Lookout and West Lookout just north of the summit (which is wooded and offers no view at all). These reach to Lake Memphremagog, the mountains of Quebec’s Eastern Townships, Camel’s Hump, and New Hampshire’s White Mountains.